I’ve worked before marriage, after marriage, taken a maternity break, gone back to work when my child was nearly two years old, worked for a couple of years and then again taken a break to be a stay-at-home mom… Phew! Now, after a long hiatus away from the arc lights, once again I’m a mom who’s returned to work. In any scenario and at any age, it’s very difficult to leave your child at home and go to work! My daughter Kiara is a teenager now and doesn’t need me 24/7 like earlier. Yet, when I returned to work last year, I felt the pangs of separation. I wouldn’t be there to receive her when she came home from school and I missed our late night chats when I’d tuck her into bed… but as she’s grown, all that’s changed too. Now she’s busy catching up on school work and chatting with friends when I return from work. We still have our little quality time – but as children grow up, perhaps it’s a good idea to go back to work, especially if you’ve been a working woman who took a break. In fact, many homemakers also return to doing what they loved or pursue new hobbies as their children become teenagers. And those hobbies sometimes turn into professions for them. So I’m very happy to have donned my acting boots again – and this is something I don’t intend to stop now. When I look back, I’m grateful for all the time I’ve spent being a hands-on mom – and I’m also grateful for all the times I got to work intermittently thanks to my incredible support system. 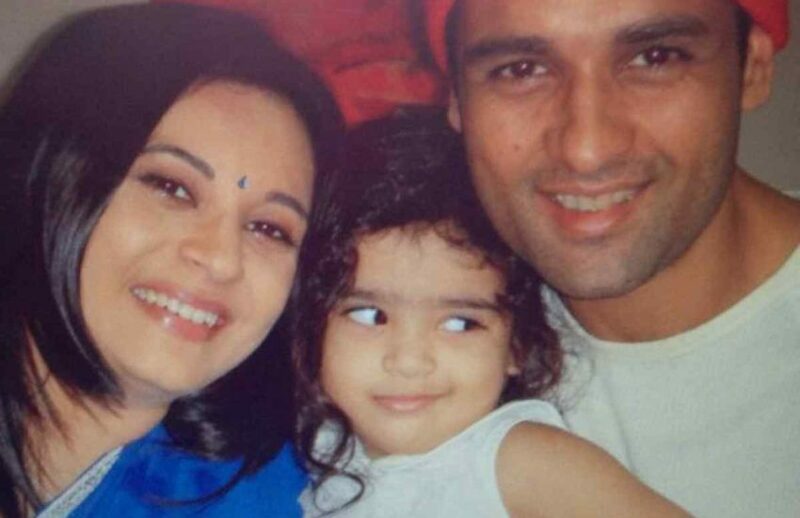 Manasi, at the time she worked on Kkusum, with her husband Rohit Roy and daughter Kiara, in 2005. I know there are many women who don’t have family around and have to leave their children with help or at day care centres while they go to work. And I can only imagine how difficult that is… which is why I say, when women go back to work after childbirth they need all the support they can get – whether it’s from their families or employers. For instance, when Kiara was two, I went back to television with the show Kkusum for Balaji. My first condition was that I’d like to work only 9 to 6, and not 9 to 9 or later, as was the norm. They agreed and that way I got to be home before she fell asleep and spend some time with her. So, having an employer who’s flexible about the working hours can definitely help. Having said that, it’s equally challenging to be a homemaker. But to each her/his own. Some people “need” to work, some people “want” to work and for some, it’s a combination of both. And then, there are some who “have” to work because that’s what they enjoy and that’s what defines who they are. Manasi, with her family, on the sets of Dhai Kilo Prem in 2017. I’ve been on both sides of the spectrum – a stay-at-home mom and a working mom –both times out of choice. But that’s because I was fortunate enough to have that luxury. And I managed to juggle it all thanks to an incredible support system at home in the shape of a hands-on mother-in-law, a supportive mother plus great help. It goes without saying that Rohit has always been the wind beneath my wings! So, I straddle work and home once again and wish all other women like me – All the very best.